The site where The Bower now stands has a long and fascinating history. The north section of the site was once an ancient pond, known as the ‘Perilous Pond’, rather morbidly owing to the many tragic drownings there. 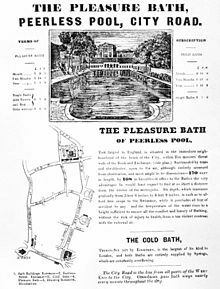 in 1743 it was turned into one of London’s first public baths and renamed ‘The Peerless Pool’. The pool closed in 1850 and was built over however it has given its name to the nearby Peerless Street and Bath Street, and obliquely to the Old Fountain pub at the end of The Bower Mews on Baldwin Street. On the southern section of the site, where The Tower (207 Old Street) stands, St Luke’s Hospital for Lunatics was constructed in 1785. In 1917 St Luke’s Hospital was closed and the building was sold to the Bank of England and was used for printing bank notes until the early 1950s before being demolished in 1963. 207 and 211 Old Street were subsequently built in 1967. The two buildings were designed with a shared language and material palette, and the original brickwork and sculptural cladding can still be see on The Warehouse, 211 Old Street. Helical plc and their joint venture partners, Crosstree Real Estate Partners, acquired the site in 2012 and began a comprehensive redevelopment in 2013. The first phase, consisting of The Warehouse, 211 Old Street, Empire House, The Studio, and 10 retail units, were completed in 2015. Helical have now bought out Crosstree’s share and commenced Phase 2 of the redevelopment, The Tower, 207 Old Street, a 171,000 sq ft office building fronting Old Street roundabout, which will be completed in Summer 2018.